Does your browser only gives you basic stuff? Upgrade and do more with UC Browser! There are tons of available browsers in the market. Each one has its own loyal followers due to their feature set and affinity to a certain brand. Example, Chrome is for Google, Safari has Apple, and the list boils down to the best performing browser in the market. If you are still using the stock browser in your smartphone or still stuck with Chrome or Firefox in your PC, UC Browser wanted you to upgrade your browsing experience. We tried downloading the app for iOS and Android and made our own spin with the UC Browser. The details? You could read them right after the fold. First, we have tested the iOS version of the UC Browser App. And unlike any other mainstream browsers, I am surprised how nifty its features can get. It runs smooth and fast; very pleasing to first time users like me. There are also commendable features that were streamlined only in UC Browser. It has the basic feature of multiple tabs browsing which lets you load considerable number of sites without getting a big chunk of memory of your device. Accessing the tabs comes in card-like fashion wherein you can just swipe left to close these tabs. It supports multi-touch functions, like swiping down with two fingers adds another tab and swiping two fingers up closes an active tab. It is also worth noting that the app has a “Find in Page” feature which lets you search specific words in the page. It's like the CTRL+F function in your PC which is a very useful feature for me. UC Browser also supports extensions which could give a good grip in user’s productivity. It also comes with a quick launch button to access full screen mode which is very appealing if you are video streaming in the browser. 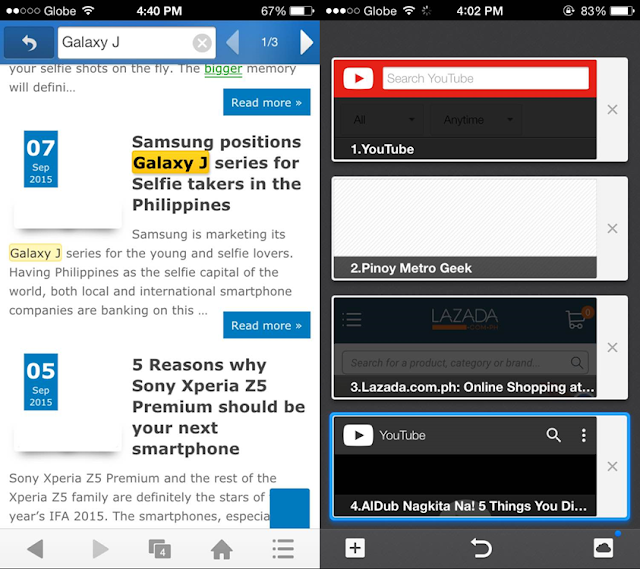 Likewise, you could also bookmark or add your favorite sites to access them in one tap. There's also a wide range of Themes for you to choose from. 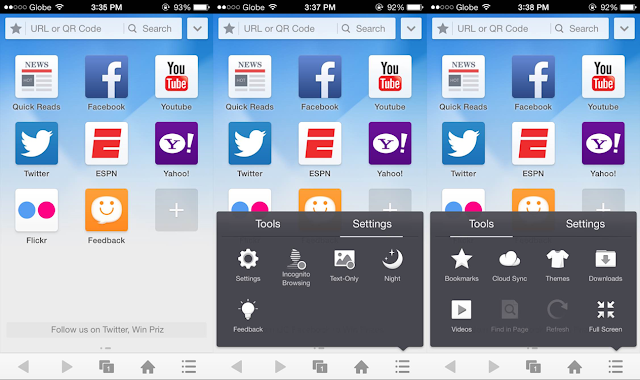 Overall, the app is clean and offers customizable browsing experience. However, there are times that the browser does not recognize light taps in the home screen shortcut apps. I tried hitting UC Browser in Android to experience its downloading capabilities. For one, I am surprised by its file downloading capabilities. I could tell that the UC Browser is a great, if not the best, browser for downloading. In contrast to other browsers like Dolphin and Opera, the UC Browser supports simultaneous downloads wherein it hosts segmented file transfer and multi-thread downloading. It divides the whole file into segments and downloads these segments at the same time in different channels which maximizes the download efficiency. The download manager interface is also clean and minimalist. 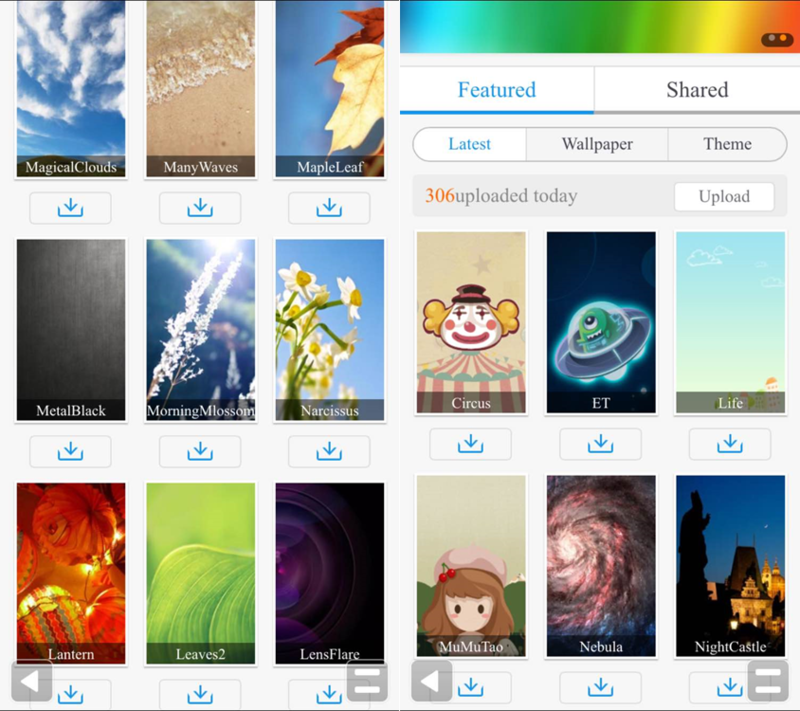 It curates the downloaded files in a neat fashion including all your saved pages for offline reading. Likewise, the browser also shows your download status through a bar which is quite exceptional. You can also pause and resume downloads at your convenience. Overall, download speed is quite fast. I could say that UC Browser has the faster downloading capability in a mobile browser space. Simultaneous downloads are quite exceptional without sacrificing page loads speed. Streaming videos in UC Browser is also a breath of fresh air. Video rendering is smooth even when played in high quality content. The video streaming interface is also straightforward. It comes with very basic and minimalist playback menus which includes pause, play, seek and time display. The volume control and full screen toggle are also very handy. Unlike other HTML5 web browsers, it could handle many video formats. What I like about the browser is that it is "social media-browsing friendly". You can also take advantage of the full screen mode for an immersive Facebook experience. If you are using the Android version of the app, things get nifty with the fact that the browser comes with optimized features for Facebook. When you log-in using Facebook in UC Browser, you can get Facebook updates on your phone's notification center. Likewise, managing your Facebook account is also a walk in the park due to the fact that you can do the basic stuff like updating status, sharing photos and sending messages in your notification bar. UC Browser is no doubt one of the powerful contenders around. It comes with great features that each user needs. If you are in the market for an ultimate browsing experience wherein you could save bookmarks, save data usage and customize your online tasks, UC Browser is a great app to start with. Download the app in Android and iOS.